Sterling Silver Vases: Unique 25th Wedding Anniversary Gift! 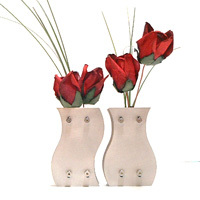 This innovative vase set has been crafted from sheets of solid sterling silver. These vases were designed for couples. The forms symbolize 2 people coming together. Though each vase looks great on its own, they were designed to be together. A special gift to celebrate 25 years of marriage... Silver is the traditional material for a 25th wedding anniversary, adding to the symbolism. This "Yin-Yang Sterling Silver Gift Set" comes with two vases. Each is 3" high. 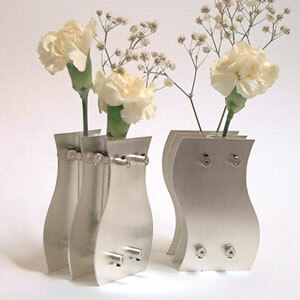 Rather than merely silver plating a metal, these vases were created with solid sterling silver. They are then specially coated to reduce tarnishing. Two glass vials come with each vase to hold either fresh or dried flowers. See our full selection of 25th Anniversary Gifts. Customer Responses for our "Yin-Yang Sterling Silver Vase Gift Set"